Intern at the Asian Studies Center! ASC is seeking three student interns for the 2019-2020 academic year! In May, Pitt will host 8 junior China Studies scholars for week-long intensive academic career development program to engage with leading Chinese studies faculty to make creative use of new media to produce public knowledge about Chinese society, culture, and history and develop research-based expertise in teaching. In these new undergraduate courses, engage in interdisciplinary inquiry on an issue of global urgency—the need for clean, sustainable water sources. This new volume, co-edited by Vice Provost for Global Affairs Dr. Ariel Armony, explores Chinese infrastructure projects in Latin America. Is the current detente between the U.S. and North Korea a historic opportunity to make real change? 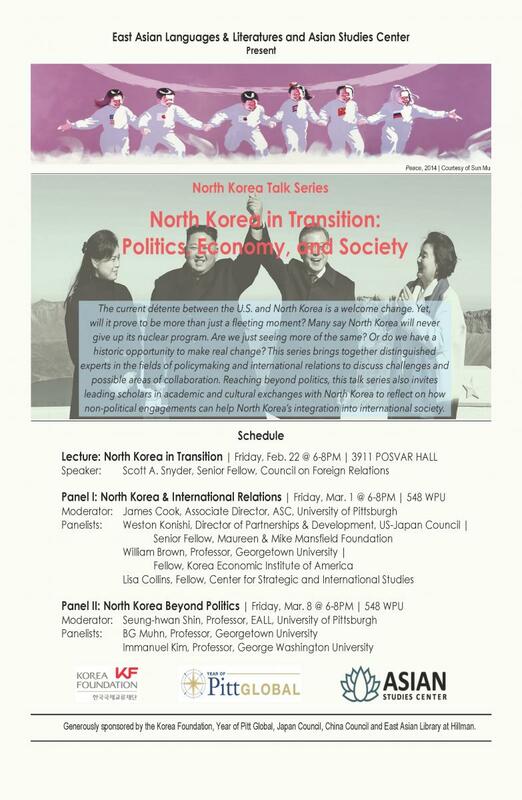 This series welcomes policy and international relations experts to discuss the future of North Korea. The Asian Studies Center is a global resource for research and education about Asia, as well as a regional center for building Asian connections. In partnership with over 100 affiliated faculty from across the university, we develop innovative research, foster community engagement, and create rigorous academic programming. Founded in 1969, the Center is widely recognized as one of the most comprehensive programs in Asian studies, with a focus on regional, transnational, and interdisciplinary scholarship. Check out our China Studies offerings here. Pitt has a robust Japan Studies program. Korea Studies are taking off at Pitt and across the nation. The ASC is expanding our South Asian studies offerings. Learn more about Southeast Asia Studies at Pitt. ASC is expanding our Central Asia offerings in cooperation with REEES.